We normally try to avoid blacked out emails from readers that have to do with the release of upcoming devices, but when it comes to the Samsung Prime, it’s hard to ignore. Every little bit of info we can grab about this phone is music to our ears. Rumored to be the first device to launch with Ice Cream Sandwich, this may be the device that we have all been waiting so patiently for. The return of a legitimate stock Android device on Verizon – mmmhmmm. 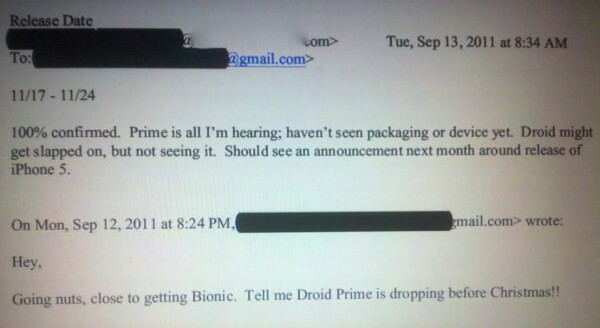 The email above, which is apparently from a deep-rooted Verizon HQ employee, claims that it may not see DROID branding (something we assumed as well) (it supposed to replace the Charge though, so that’s up in the air), but may get announced right around the time that the iPhone 5 is – more than likely in October. I will say that I’ve spoken with some of our friends who are well aware of this device. While we have yet to hear of it finding its way into the hands of a bunch of testers, we are positive that there are live units around and in the hands of select individuals at this time.